Welcome to Mallard’s Nest in Pigeon Forge! 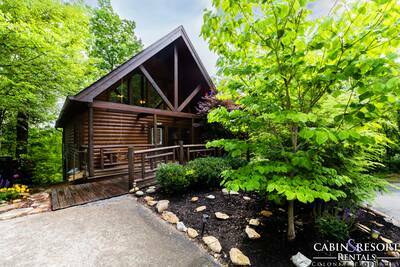 This 1 bedroom, 1 bath Smoky Mountain cabin rental offers the perfect opportunity for rest and relaxation when staying in the Smokies! You’ll love relaxing on the covered deck or screened porch while enjoying the view of the stocked fishing pond located just a few steps away. Step inside and you’re greeted by a spacious and open floor plan with a beautiful cathedral ceiling overhead. Cozy up next to the fireplace, read your favorite book, or just kick back and watch your favorite shows on the flat screen TV. 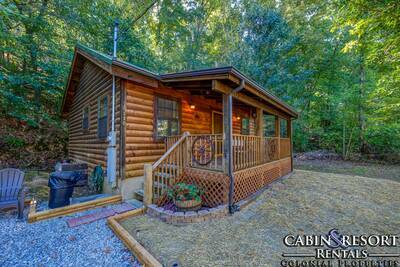 The living room also provides you with convenient deck access, spanning all four sides of this amazing log cabin. You’ll love the bubbling outdoor hot tub, rocking chairs, or enjoying morning coffee or lunch on the picnic table. Adjoining the living area is the studio style bedroom with a custom log king bed, perfect for cuddling up with your loved one and enjoying a good night’s sleep. Just steps away is the fully equipped kitchen with upgraded granite countertops. 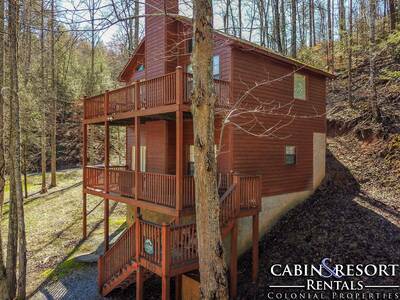 Here, you can prepare, cook, and serve your favorite meals, all from the comforts of your luxury cabin rental. Head downstairs at Mallard’s Nest and enter the fun and exciting gaming area. Here you’re treated to a pool table and wet bar, perfect for a night of entertaining and enjoying the company of your loved ones. When staying at Mallard’s Nest, be sure to bring along your fishing pole so that you can take full advantage of the catch-and-release fishing pond. 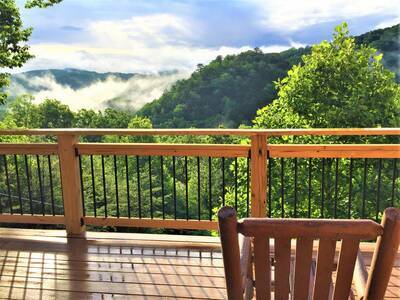 This Smoky Mountain cabin rental has so much to offer you and your guests, it’ll truly be an experience you will forever cherish. Plan your escape to Mallard’s Nest today! A: It would be approximately 20-30 minutes depending on which entrance you chose for the park. 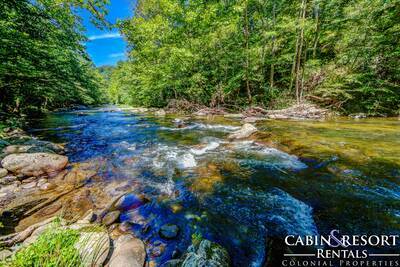 It's closest to the Wears Valley entrance near Metcalf Bottoms Picnic Area. A: Hi Donna! There is a property location map located at the bottom of the cabin page that should assist you! The roads are not considered steep. A: No, you do not have to have a license to fish at the resort!